Shorter version dress has back vent; evening length version has front slit. Back V-neckline and back zipper. Waist length jacket with slim shawl style collar has front button closing and 3/4 length sleeves. Cummerbund fastens with hooks and eyes. 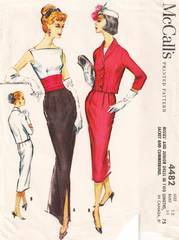 Size 12; Bust 32; Waist 25; Hip 34. Uncut, complete and in factory folds. Envelope has archival document tape repairs/reinforcements on edges. 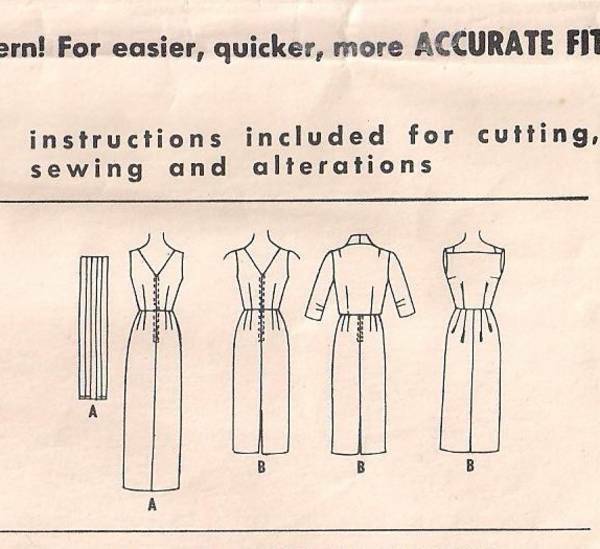 Pattern pieces and instructions are in fine condition.